There you are at work…spending the day like any other. Between the usual meetings and making headway on some big projects, you take a quick drink of your iced tea and start chewing on ice. You don’t think much about it since it’s been a habit for so long, but all of a sudden… crunch. You feel something give way on a back tooth and get the distinct impression that you’re suddenly chewing more than just ice. You have a broken piece of filling in your mouth! How could this happen?! You’ve been chewing on ice for years but apparently, this was one time too many. If you’ve ever found yourself in a situation like this one you know it’s an experience you’d rather not repeat. 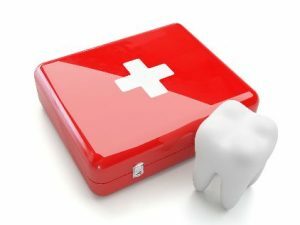 In this blog, your dentist in Sapulpa will talk about simple ways to prevent these things from happening in the future. How Can You Avoid Accidentally Damaging Your Teeth? Dry Mouth – Many common medications can cause dry mouth, which puts you at a higher risk for cavities. Stay well hydrated, use a fluoride mouthwash after brushing and flossing, and talk to your dentist about additional ways to counteract it. Contact Sports – Wear a mouth guard to protect your teeth from injury. Sugar – Soda, candy, dried fruit and juice are all examples of sugars that can greatly increase your chance for getting cavities. Do your best to avoid snacking on these types of foods and if it can’t be avoided be sure to brush as soon as possible. Tobacco – Chewing tobacco, in particular, is harmful to your mouth and can increase your risk for oral cancer. Hard Candy – In addition to ice and hard candy, do your best to avoid opening anything (especially bottles) with your teeth. Doing so can cause your teeth or dental work to break. Clenching and Grinding – If you’re one of the many people who clench and grind at night, a night guard can protect your teeth from damage like cracks or fractures. Certain Beverages – In addition to avoiding sugary beverages, try to minimize beer, wine and even diet soda. These drinks contain acids that can wear away your enamel. If despite your best efforts, you find yourself in a situation where you’ve damaged your teeth, your first step is calling your emergency dentist in Sapulpa. That way you can schedule to come in for evaluation and treatment – even outside of normal office hours if necessary. Your dentist can also tell you how to handle the situation until you can be seen. Life doesn’t always go as planned. But these guidelines can at least help you avoid some of the most common dental mishaps and avoid emergencies! Dr. Parnam Mohanna and Dr. Dalia Georgy are a husband and wife team that has made professional excellence a priority. In addition to providing outstanding dental care they always take the time to help their patients learn how to keep their teeth healthy in between visits. They can be reached with questions via their website or at (918) 216-1000.